Barbecued Salmon, Thyme for Cooking gourmet main course from the grill. In small bowl mix all ingredients except salmon and paprika. Put salmon in a grill basket if using barbecue grill or on mesh grill pan if you don't have a basket. 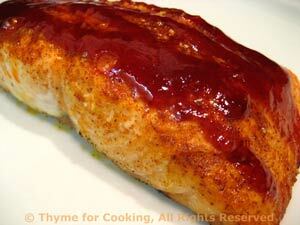 Brush fish with part of the barbecue sauce. Cook on barbecue grill for 10 - 14 minutes with cover partially closed, basting with the rest of the barbecue sauce towards the end. OR put on baking sheet, spoon sauce over and roast in 400 F oven for 15 - 20 minutes, depending on thickness. In both case salmon will be done when it flakes easily; slightly pink in the center is fine. Remove from heat and serve, sliding it off the skin if needed.